With thanks to Sam for the title! So I ended the last post with thanks for all the support I’d received from the big day of anxiety but it didn’t stop there! I spent 45 minutes at the Day Assessment Unit at the Queen Elizabeth having Blob’s heartbeat and movements monitored. She hadn’t really moved anywhere near as much as I would have expected her to in a good 48 hours and as the wise twitterati advised to get her checked and Paul pretty much handed me my clothes, it was a good idea to be checked over and find out what was going on. 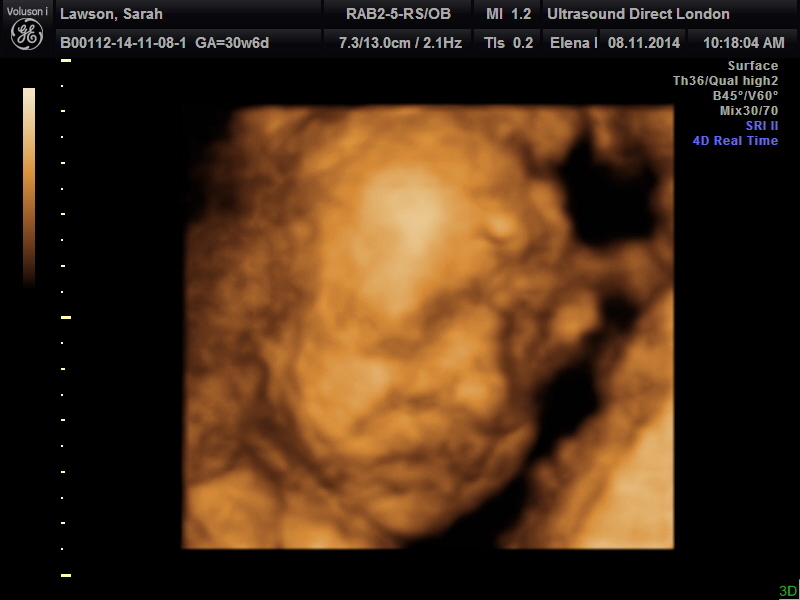 As soon as the midwife put the belly bands and monitors on my tummy, she started flailing around, desperately trying to kick the monitors off and trying to wriggle away from the doppler. Luckily it wasn’t busy so I was seen very quickly and the midwife didn’t laugh when I was all sheepish at the amount of effort that madam was putting into walloping the monitors. Nice to be taken seriously! 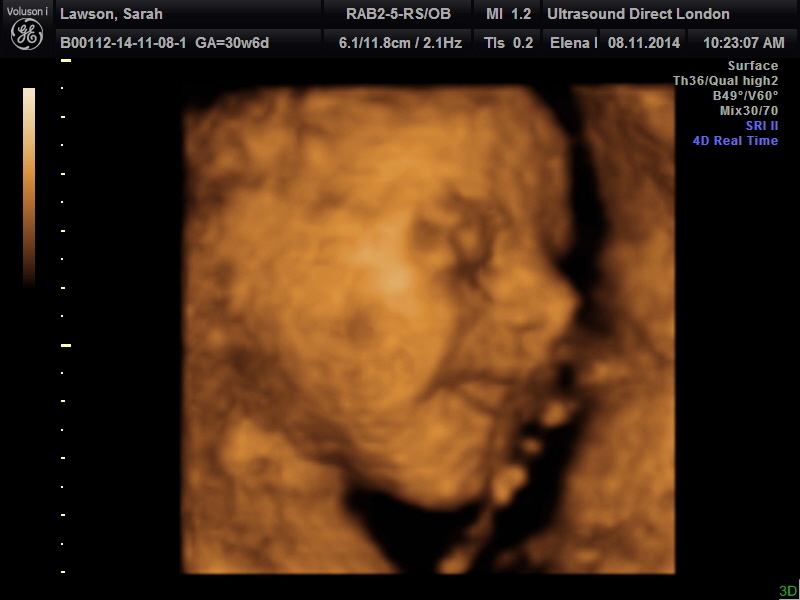 With D-Day roughly two months off, we have some photos of Blob thanks to the 4D scans. This is the re-scan from the end of September that was moved to the end of October and then rescheduled for today due to a broken scanner. Straight off she’s moved so hardly surprising that I’d felt a change in movement- she’s now got her face turned towards the left-hand side of my ribcage, so the right side of her body is matching the right side of mine and her bum towards my pelvis. 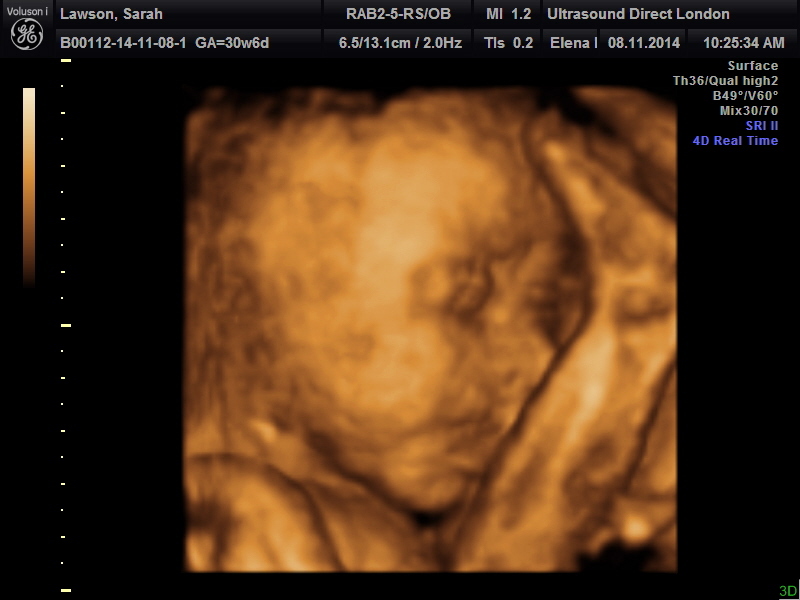 Heart was fine (I panicked when I couldn’t see it but the sonographer was happy!) She was asleep, with her face turned slightly towards my spine and it took a lot of belly jiggling, going to empty my bladder and jumping around to get her to wake up and turn! When she did, she pulled the grumpiest face as if she was going to cry and stuck her foot up by the left-hand side of her face!!! Gradually, she made faces as if she was smiling and sticking her tongue out but goodness, is she Paul’s daughter! Hard to wake, grumpy when woken and features-wise she really looks like him! 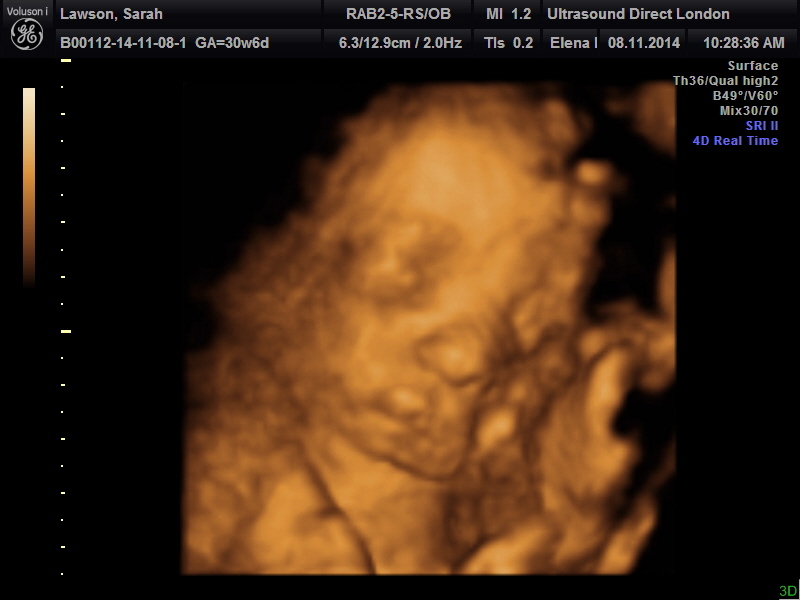 So here she is, my little drama llama being just as awkward and stubborn as her parents. The foot by the face shot-definitely got mum’s flexibility-dad’s hamstrings barely go into a sitting position! You buggers have woken me up? Right, now I create hell! Is that a grin or gas? Can I go back to sleep now please? I would recommend having it done as I feel like she’s really coming now. That’s our little girl. Paul couldn’t help but gasp when he saw her and the pride I felt when I heard him do that was incredible. Lia had her fingers or toes up her nostrils in our photos. These are great! Blob has an obsession with obscuring her face-arms, legs or snuggling into me! No fingers up the nose-that would have had me in hysterics! Little alien girl! 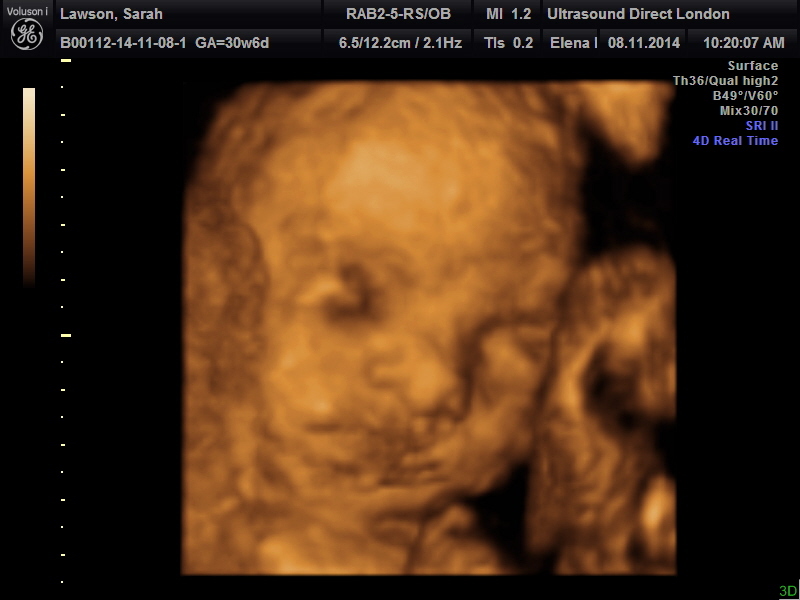 Big chubby cheeks like her daddy! Super cute and so cool that you got an open eye shot! 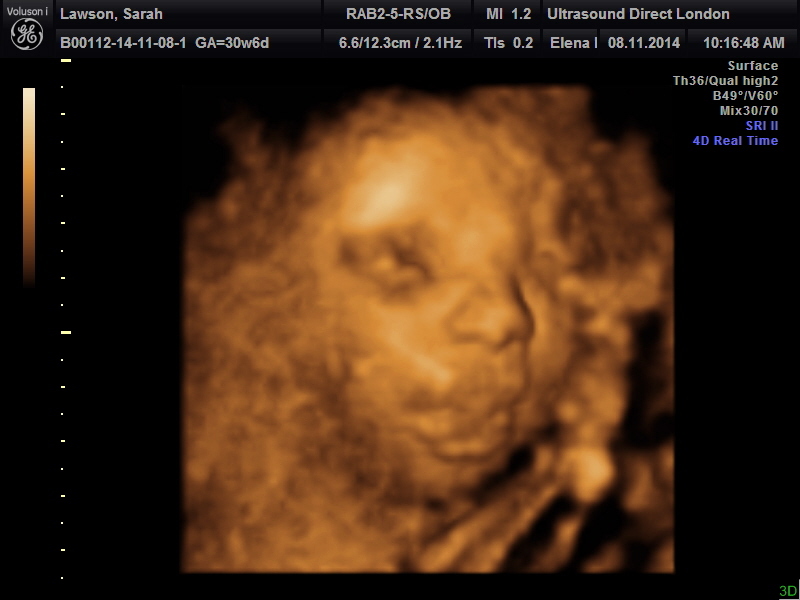 It was very weird watching her blink and open and close her mouth at us! Do you know where “drama Llama” comes from? The Llama Llama books are amazing. We had almost all of them when I nannied the boys… Buy them all!